When I read that a Finnish tourist had vandalised one of the ancient Moai statues on Easter Island, my first thought was the bad title now heading this piece. However, as I considered how arrogant this man's actions were, I began to feel the seed of anger germinate into the need to write a fully-fledged article about people just like him… tourist terrorists, if you will! The despicable actions of the Finn on Easter Island, a UNESCO world heritage site, reminded me of a family trip to Lanzarote many years ago. We took a coach tour to visit the site of a dormant volcano and were able to walk across the hardened surface - the geologists among you will know the proper term - feeling the heat beneath our shoes, or sandals in many cases. As we returned to the coach we saw the tour guide ordering people to return the souvenir lava rocks to the site; lava rocks that they had to carry with two hands! The guide was right. If lava rocks were removed by each visiting coach tour there would soon be nothing left for future tourists all because somebody wanted a rock large enough to act as a fancy doorstop back home. "Go before it's too late!" states the slogan of Kilroy Travels, reinforced by a recent shock tactics advertising campaign that features a Photoshopped road through the centre of Australia's Ayer's Rock and escalators transporting visitors up to the Giant Buddha on Hong Kong's Lantau Island. 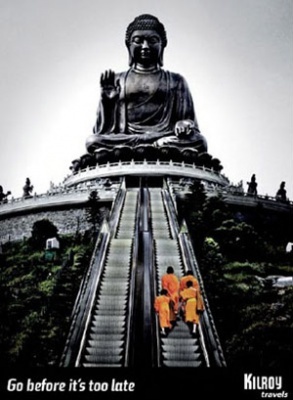 These adverts are dangerously close to reality as access to every nook and cranny of the globe is being exploited by an increasing number of tourists - why shouldn't there be an escalator to the Giant Buddha for disabled guests? There is a black and white photograph in one of the family albums of my parents and a friend standing beside, probably leaning on, one of the stones at Stonehenge. Judging from my dad's haircut and afghan coat, the photo was taken in the 1970s when tourists were free to walk right up to the stones, climb on them and be overwhelmed by their scale, but now visitors are permitted only to walk the circular path 50 metres from them. Part of me feels cheated out of the experience of touching the surface of the stones. I'd love to place my hand on the cold rough surface and try to comprehend the historical and engineering feat involved in their creation, but when you are standing 50m away you may as well look at a photograph. I respect the reasons for their continued protection; I want them to be in the same condition for my children and their children, protected from idiots like the Finn on Easter Island. The one experience that I will never forget is on a visit to Las Vegas when we took advantage of a helicopter flight into the Grand Canyon. The Grand Canyon is one of the few experiences that doesn't disappoint when you finally arrive, and no photograph could ever do it justice. However, the best part of the trip was landing on the floor of the canyon and watching the Colorado River flow past, but this was only possible on a section not designated a US National Park. After the helicopter departed, albeit for the swirling blades of the helicopter and our footprints, there was no sign we had ever been there. We didn't take away chunks of the canyon, drop litter, discard cigarette butts or desecrate the place, we treated it with the respect it demands and deserves. The helicopter company will do hundreds of flights every year to that location and you can only hope the pilots continue to keep a watchful eye on the activities of their passengers for everybody's sake. Some aspects of tourism are grey and will trigger passionate discussion on both sides of the argument, but when it comes to the actions of that one Finn on Easter Island we should be united in disgust. Just who does he think he is that makes him decide he can break off part of an ear from a Moai statue in order to take it home as a souvenir? The next step will be a repeat of what I once saw in Sardinia: fibreglass replacements. Do we really want that? Unfortunately people have been arrested for taking rocks from Acropolis, not to mention the British museum!!! Indeed. Not to speak of stolen works of art now in the British museum, such as the so called Elgin Marbles removed from the Acropolis in Athens in 1806 by Thomas Bruce, 7th earl of Elgin who was British ambassador to the Ottoman Empire. England refuses to give them back to Greece in the name of “universal” art. There is also an Etruscan chariot which the Metropolitan Museum of Art and the US refuse to give back to Italy. At that point it becomes problematic to distinguish who are the greater barbarians: the vandalizing tourists or the stealing ambassadors? I suppose vandals and thieves will always be with us. Michelangelo’s Pietà cannot be touched any longer, it is now behind a bullet proof glass since it was vandalized in St. Peter’s Basilica by a deranged tourist. Catholic Church bashers will insist of course that the Pietà ought to be sold and the proceed be given to the poor. That attitude may reflect a concern for the poor. More likely it reveals an insensitivity to art bordering on cultural philistinism and barbarism of the intellect. I think that the former is an expression of the latter and I fear that it is as much of a problem as the vandalizing and the stealing of works of art. Pauli, why do you think the anger is because the vandal was a Finn? Get over yourself! It wouldn't matter what nationality caused further damage to the statues i would have still been furious. Plus, just because they are in a state of disrepair doesn't mean any idiotic tourist can hack away at something.